To avoid warming of your grids during shipping to NeCEN, we advise you to follow these instructions to properly prepare and test your dry-shipper. We have good experience with Taylor Wharton dry-shippers. The CX-100 model is a reliable one. Shipping can take 2-3 days; sometimes more. We advise you to ship your samples well ahead of time. If you have questions please do not hesitate to contact us. Make sure your dewar is dry before filling it up with liquid nitrogen to avoid damage. To properly prepare you dewar, it needs to be filled a few times with liquid nitrogen (minimize the spill of nitrogen to the vacuum seal at the top to avoid damage). This is neccesary as the inside of the shipper is padded with an adsorbent material that needs to be saturated with liquid nitrogen. In between each fill, wait 20 minutes, and repeat the filling until liquid nitrogen remains at the top of the dewar. 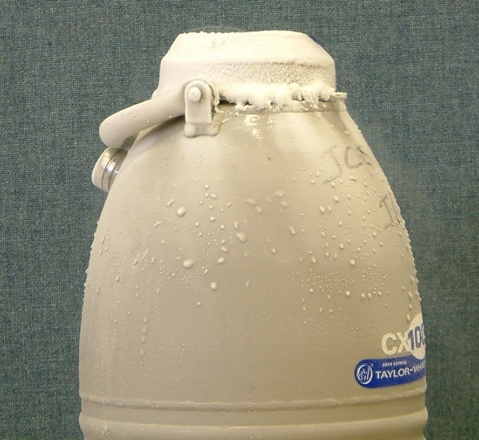 Before storing your sample in the shipper, empty the excess liquid nitrogen. It is advised to test your shipper before shipping to avoid unexpected warming of samples during transit. Once the shipper is properly cooled down and emptied as described above, wipe the outside with a cloth and wait a couple of hours. If excessive condensation appears outside the dewar (see pictures below) the shipper is damaged. The vacuum seal is most likely broken and the shipper should NOT be used! We advise to use standard cryo-grid boxes with screwed lids. Please do not use handling sticks. Place the grid boxes in Falcon tubes which are connected to a cord and put something heavy (like a screw) inside the Falcon tube to prevent it from floating inside the dewar. We prefer Fedex as shipping company. Please note that the dewar should stay at NeCEN until the data collection is over.